While I sit here, starving, awaiting the terrible 7 pound suffering that lies ahead of me, all I can think about is food. I don’t know why, but when I’m dieting for a fight, I have no interest in anything on television other than cooking and food shows. I don’t know why I torture myself. I tell my wife that it’s my version of “window shopping”. Maybe I’m trying to gather ideas for my cheat day. What’s a cheat day, you ask? Well, it’s the only thing I get to look forward to during a week of rigorous training sessions and bland food. I was training for my second (I believe) fight when Eliot Marshall and I were discussing our various diets to get down to weight. Eliot told me “on Sunday, you can have a cheat day — you can eat whatever you want”. Those words were music to my ears, and I certainly took them to heart. Eliot was furious the following Monday when I had gained 9 pounds, part of which could be accounted to the entire gallon of ice cream (and the fried chicken/bbq/candy/etc) I had eaten the day before. Since then, I’ve obviously had to pull it back a bit. However, every Sunday, without fail, I give myself two meals and a snack of whatever the hell I want. It’s the only thing that keeps me sane. 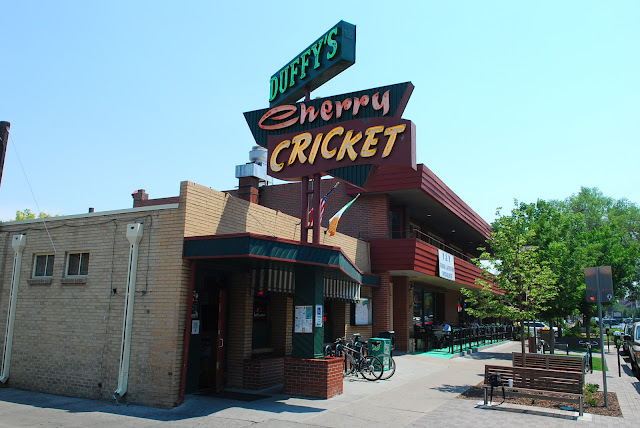 My great grandfather, Bernard Duffy, founded the Cherry Cricket in 1965. I believe he sold it sometime in the 70′s, which is a damn shame, because it now takes up an entire city block in the affluent Cherry Creek neighborhood, and is one of the most popular restaurants in Denver. My wife loves the burgers here (many say they’re the best in Denver), and I’m pretty fond of their wings. They also have incredible french fries. The Old Man is a beat up, divey kind of bar off 120th in Broomfield. They have decent BBQ, and they have an incredible selection of crappy beers. When I don’t have a fight coming up, I go here a fair amount to drink Schlitz, Colt 45, Olympia, and Hamm’s. It’s one of my favorite places to watch fights, and the bartenders are all cool as hell. The real reason to go here, though, is their smoked wings. As I’ve said before, fried chicken is a way of life for me. I love all varieties — traditional fried chicken… buffalo wings… throw some sugar sauce on there and hook me up with some sesame chicken… I love it all. 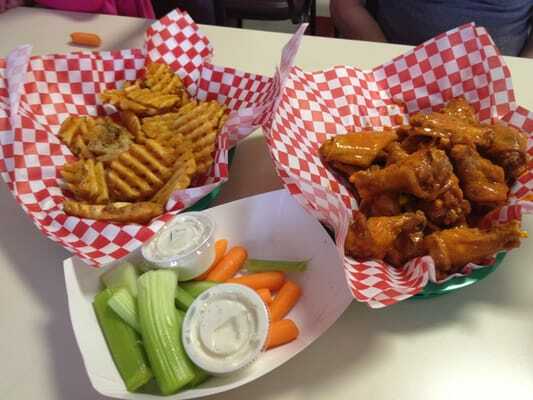 If you’re not looking for a straight up buffalo wing, this is a great place to get some variety. The smoked wings here are the best I’ve had. Now, if you’re looking for some straight up, traditional hot/buffalo wings, this is the best place in Colorado that I’ve found (I should note that I haven’t tried Willy’s Wings in Morrison yet, despite several recommendations). My wife isn’t crazy about this place because, you know, women like something called “ambience” when they eat at restaurants. I only care about one thing — how the food tastes (this is why my wife argue when I want to eat at the Bourbon Chicken on Colfax, as well). This place is really just a take out place with deep fat fryers and a couple of tables in front of the counter. That said, the wings here are incredible. If you want anything fried, this is where you should be. I’ve been eating regularly at Brothers BBQ since I discovered the Monaco & Leetsdale location in high school. It’s been a go-to spot for over ten years now. My current home in Broomfield is less than a mile from a Brothers BBQ location, which is a dream come true for me. Brothers has consistently solid BBQ, and they’re always adding things to the menu. You can always go for the ribs, pulled pork, brisket or chicken, but they also have burnt ends, beef ribs, and wings among other things. The Broomfield location is also going to be adding fried chicken to their menu, which will more than likely change my life. To top it all off, Brothers BBQ has been a huge local MMA supporter from day one, sponsoring Ring of Fire events as well as local fighters like Luke Caudillo, Duane BANG Ludwig, and some dude named Tyler Toner. This is the ultimate cheat meal. One of my friends described eating here as feeling “like a king — BRING ME ALL THE BEASTS OF THE LAND SO THAT I MAY DINE ON THEM”. Texas De Brazil is a Brazilian Churrascaria, where meat is cooked on a modified rotisserie and brought to your table on skewers. You begin by taking as much food as you want from the most incredible salad bar you’ve ever seen (but get real — who eats salad on a cheat day?). When you’re done playing games, then you get down to business at your table, which has a small place card with a green side and a red side. When your place card is flipped to green, the servers constantly stop by your table cutting freshly roasted meats onto your plate. The menu includes beef ribs, filet mignon, Brazilian sausage, lamb chops, pork loin, bacon wrapped chicken, and a host of other meats. I usually eat until I’m literally disgusted with myself, flip my card to red to contemplate life for a bit, and repeat two or three times until I can’t move or fall asleep in my chair. There you have it — my 5 go-to cheat day spots. Feel free to leave suggestions, as I’m always looking for new places to become fat. ← RFA 11 Opponent Change!